The Soft Coated Wheaten Terrier is the traditional Irish farm dog. For many years they were taken for granted as part of the landscape, being part of the day to day work of the Irish farmer. They were not taken up by wealthy dog enthusiasts but were seen as the poor people’s dog. Under the penal law of the 18th century in Ireland tenant farmers were prohibited from owning a dog worth more than $5. This makes it likely that the anonymous terriers, later to be known as the Soft Coated Wheaten Terrier, were the dogs kept by the poor Catholic tenants. The English landholders had the more expensive Wolfhounds. The Soft Coated Wheaten Terriers were bred to earn their keep and were an all-purpose dog. They were bred to hunt, heard, catch vermin, stand guard to be a companion, and to poach. Initially the four breeds of Irish Terriers were lumped together under the name of Irish Terrier, although there had been four distinct breeds of terriers in Ireland for 200 years. It was not until 1937 that the breed was recognised by the Irish Kennel Club and named the Soft Coated Wheaten Terrier. 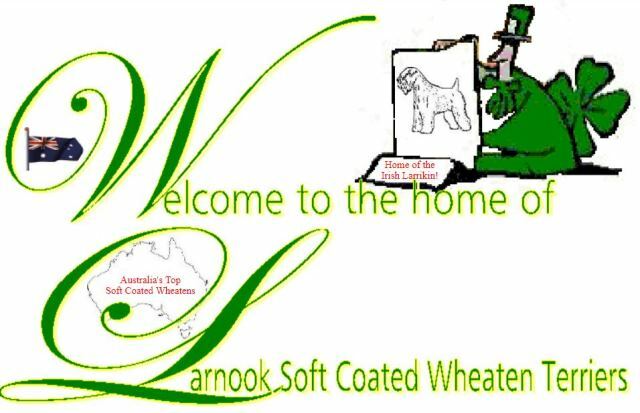 Claims have been made that it is the oldest of the Irish terrier breeds with soft wheaten coats sometimes showing up in litters of pups in the other breeds of terriers from Ireland. There is a story that they were numerous in the 18th century in Kerry. It was at that time that a large black dog, possibly a spaniel, swam ashore and mated with a Soft Coated Wheaten Terrier. The result of this cross being the Kerry Blue Terrier. Because the Soft Coated Wheaten Terrier was a very common dog in Ireland its humble beginnings were probably from a very mixed ancestry with Wheatens being allowed to mate freely with whatever other dogs were around. In contrast, the breeding of the Kerry Blue Terrier and Irish Terrier were deliberately controlled at an early date so that they were recognised as separate breeds earlier than the Soft Coated Wheaten Terrier. By the 30’s however Soft Coated Wheaten Terrier enthusiasts in Ireland, namely Dr G.J. Pierce and Mr P. Blake, were more selective in their breeding, developing a breed with distinctive traits. More recently Maureen Holmes has worked diligently to further develop the breed. 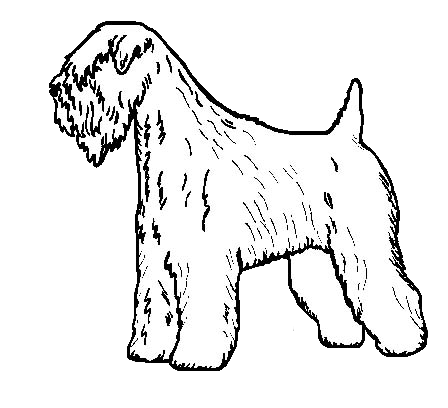 Since the Soft Coated Wheaten Terrier was a working terrier, used in such difficult jobs as hunting otters and badgers, it excelled when it first appeared in field trials taking prizes more often that the other terrier breeds. Having its origins as a household member it tends to have a gentle temperament whilst being loyal and intelligent. Its alert carriage, free movement and properly managed and presented coat has made the breed popular in the show ring. Selective breeding in America and Europe have developed a popular and glamorous terrier. The Native Dogs of Ireland (1984), Dublin: The Irish Kennel Club.